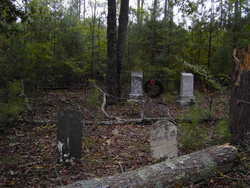 I lived, for several years of my childhood, in the house next to the Webber/Haile Cemetery in Jonesville, SC. My brother and I spent more hours than I care to count playing among the headstones of the dearly departed. my brother, a neighborhood girl named Jill, and yours truly rubbing the bright green leaves of the abundant poison oak found in the graveyard all over our arms and legs, hoping that the ensuing rash would relieve us of a few days of school (the hoped for rash never appeared). There is a small mausoleum standing in the midst of graves. My brother and I would peer into the structure, wondering silently about the souls interred, and musing aloud about the broom that always stood in the corner. We never saw a living person enter the vault, and our imaginations had the dead sweeping the dust from their eternal crypt long after the neighborhood was fast asleep. The most intriguing grave in the cemetery was an ancient one, surrounded by large stones, and elevated slightly above ground. It was the perfect spot to climb onto and jump off. If I ever bothered to read the headstone, the memory has escaped me. Years passed by, and my interest in genealogy was sparked. My journey into documenting the Fowler men and women who lived in Union County, South Carolina in the eighteen and nineteenth centuries led me back to the playground of my youth, the Webber/Haile Cemetery. Once again, I found myself spending hours in the familiar, old graveyard. The grave that I found most interesting as a child became even more interesting to me when I discovered that it was the oldest one in the burial ground, the headstone broken in half, the final resting place of Milligan Fowler. I have done much research on Milligan Fowler. He was the son of Godfrey Fowler and Nannie Kelly. He was born on February 13, 1802 and died March 12, 1871. In 1850, Milligan Fowler lived next to the households of his younger brother Coleman Fowler, his father Godfrey Fowler, and his older brother Thomas Gillman Fowler. At age 48, he lived alone, no wife or children. It is thought that the Henry Ellis Fowler family arrived in Union County, SC in the late 1700’s as Quakers The members of the Quaker faith believed that slavery was absolutely and morally wrong. There is no evidence that the early Fowler immigrants came to Union County with slaves. Perhaps, after their arrival into the county, their abandonment of their Quaker faith in order to join up with the Baptist and Methodist congregations, and their accumulation of large parcels of land which led to the need for field hands made the distasteful decision to own other human beings acceptable to them. Whatever their reasons for owning slaves, the cold, hard fact is that some of the Fowler families did own them. In 1850, Milligan Fowler owned two adult males (ages 26 and 41), one adult female (age 24), and three male children (ages 6, 5, and 3). His father Godfrey, and his brothers Thomas and Coleman were also slave owners. On November 22, 1850, the same day that Milligan’s slaves were counted, his agriculture production was also recorded. From the schedule below, we learn that he had 100 acres of improved land, and 117 acres of unimproved land, with a total value of $2000. He also owned $90 worth of farming equipment. His livestock was valued at $400 and included 4 horses, 2 milk cows, 5 heads of cattle, 10 sheep, and 35 hogs. He was in possession of 180 bushels of wheat, 500 bushels of corn, and 50 bushels of oats. For a single man living alone in 1850, Milligan appears to have been a very successful planter, albeit his profits were earned on the backs of enslaved souls. In 1860, Milligan Fowler, ever the bachelor and now in his late 50’s, still lived alone. It is apparent from his position in census records that he had moved a short distance away from his immediate family. He was, however, still near his kin. The Daniel Moseley who lived next door was Milligan’s first cousin. Daniel was the son of John Baxter Moseley and Henrietta Fowler, daughter of Henry Ellis Fowler and sister to Milligan’s father Godfrey Fowler. There are slave and agriculture schedules in 1860 for Milligan Fowler. He had increased his wealth over the past decade. He owned more land, valued at $3000, and he had more livestock. Life was good for Milligan, prior to the great war. I have found little information regarding Milligan during the wartime years. There is no record of his service in the Confederate Army, but his advanced age would have made his enlistment unlikely. The end of the Civil War in 1865 freed the slaves and a new era began in the deep south. Milligan Fowler still owned hundreds of acres of land in Union County, and the need for men and women to work in the fields did not simply vanish. The Freedmen’s Bureau was established in 1865 by the U.S. Federal government. Its purpose was to help the freed slaves transition from their former enslaved lives to their new lives as a free people. I could write chapters on the successes and failures of the agency. Although some good for the former slaves came out of the creation of the Bureau, their former white owners often benefited more, especially from the newly created labor contracts. In 1870, Milligan Fowler no longer lived alone. There was a Nancy Fowler, aged 67, in his household, as well as two older black women, Rhiner aged 70, and blind Susan aged 99. Perhaps Rhiner and Susan were former slaves. Milligan was recorded in the census in September. A month later, October of 1870, he penned his will and bequeathed $40 to Rhiner upon his death. The Nancy Fowler, aged 67, in Milligan’s household of 1870 is a little bit of a mystery to me. I am guessing that she is the same Nancy Fowler, aged 46, who lived in the household with Godfrey and Nannie Kelly Fowler in 1850. There was also a Thomas Fowler, born circa 1833 in the Godfrey Fowler household of 1850. I almost believe that Nancy was a daughter of Godfrey and Nannie Kelly Fowler, and a sister to Milligan. The jury is still out on this. I need more proof. I have considered that Nancy may have been a daughter-in-law of Godfrey and Nannie. If so, was she an estranged wife of Milligan, and was the Thomas Fowler in the Godfrey Fowler household a son of Milligan? Too many questions at this point with no answers and no documentation. The search for truth continues. I observed that many of the households which surrounded Milligan’s home in 1870 were that of recently freed blacks. I have to wonder if these were former slaves, and if the homes they occupied were on the land of Milligan? It was also interesting to me to find Joseph K Fowler, (son of Thomas G. and Susannah Hames Fowler) living with WT Littlejohn and family next door to Milligan, and three of Womack Fowler’s grandchildren Lucinda, Elizabeth, and Hulda Gibson, (daughters of Tempa Fowler Gibson) living adjacent to Milligan, as well. Milligan Fowler signed and dated his Last Will and Testament on October 18, 1870. He left his sister, Milly McWhirter, $200. As stated in a paragraph above, he left Rhiner, the black woman who lived with him, a gift of $40. He bequeathed to his Aunt Betty Fowler the land upon which she lived, and at her death, he wished the land to be passed on to her son, Walter Gaines Fowler. His Aunt Betty was Elizabeth Moseley, widow of Mark Fowler. He granted 1/3 of his estate to his younger brother Coleman Fowler who was living in Arkansas at the time. He left 1/3 of his estate to Felix C. Haile, resident of Texas. If Felix died before Milligan, one half of his share would go to Coleman Fowler; Charles and Joseph Fowler, (sons of Thomas Gillman Fowler), and John and Sarah Fowler (children of Dr. Wade Fowler who was a son of Milligan’s oldest brother James Fowler) would share the other half. The remaining 1/3 of the estate was left to Charles and Joseph Fowler (sons of Thomas Gillman Fowler), and John and Sarah Fowler (children of Dr. Wade Fowler). It should be noted that two of Milliigan’s brothers had predeceased him: James Fowler in 1858; and Joseph Fowler in 1852; His brother Thomas Gillman Fowler died in 1880, and brother Coleman Fowler died in 1877. His remaining brother William was likely dead before 1870 as there are no records to be found of him, and he was not mentioned in the will. Milligan’s will was recorded in Will book D, pages 28 to 30; Box 55; Package 7 on April 14, 1871.
expenses be paid out of my estate by my Executor herein after appointed. her legacy is to remain a part of the body of my Estate. of it during his life. bequeath to my nephew Charles Fowler and Joseph Fowler sons of Thomas G.
Fowler. But Joseph Fowler is to have free use and control of the same. And I hereby nominate to constitute and appoint my friends Elijah J.
Wright and Dr. Wade Fowler Executor of this my last will and testament. Was Milligan the father of Felix C. Haile?